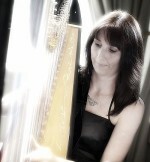 Oona is a professional harpist of many years' experience, available for weddings and functions in Cheshire, Merseyside, Greater Manchester, Lancashire, Shropshire, Staffordshire and North Wales. 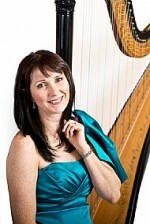 Having gained a Bachelor of Music degree from Edinburgh University in 1984, Oona continued her studies on the harp with renowned harpists Eira-Lynn Jones and Elinor Bennett, to achieve a Performers' Diploma (DipABRSM), followed by a Masters degree at the University of Wales in harp performance and the study of music of the Celtic countries. 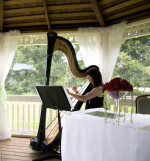 Oona has established a busy and successful career as a freelance harpist, with such diverse engagements as a cocktail evening for the Duke of Westminster to a Valentines' 'Singles Evening' for Safeway Supermarket, as well as numerous weddings and corporate events. She offers a wide repertoire of music in different styles from classical, to Celtic, to modern, on both the large concert harp and smaller Celtic harp, tailored for the particular special occasion and helping to create the perfect ambience for your event.